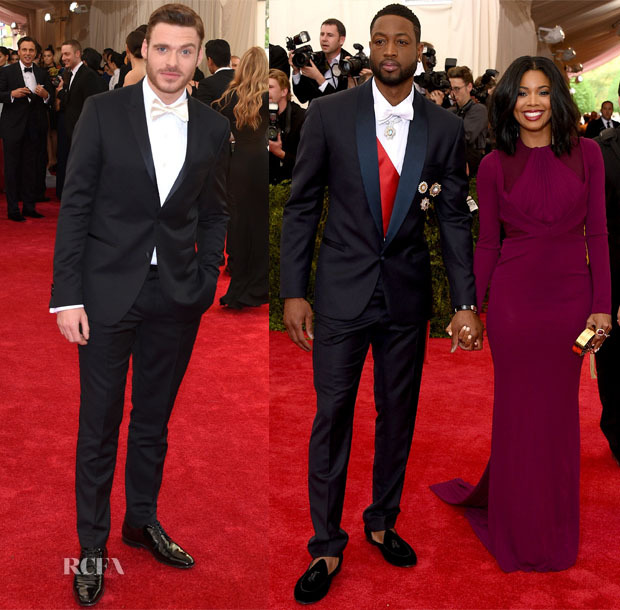 With the tidal wave of gowns and tonnes of sparkling embellishment at the ‘China: Through the Looking Glass’ 2015 Met Gala, hosted at the Metropolitan Museum of Art in New York City on Monday (May 4), the guys’ looks were a handsome, albeit less extravagant, accessory to the girls. Rather than attempting to accomplish the Chinese theme, some of the men reverted to safer, traditional tux territory while others bravely went in the direction of the East. Robert Pattinson: This is the Robert Pattinson I like to see—polished and handsome without losing his edgy, bad-boy charm. His elegant Dior Homme three-piece tuxedo was one of my favourite men’s looks of the night. James Marsden: The actor infused another layer into his Ermenegildo Zegna ensemble, elevating the look with a cream jacket paired with a white tuxedo shirt and black trousers. Matt Bomer: Showing off the power of the classics, he was dapper in a dark Giorgio Armani suit and bow tie popped with the hint of colour in his pocket square. Usher: He may have been working a Velcro boot and cane after a foot surgery last month, but it was barely noticeable given his striking Calvin Klein Collection double-breasted black tuxedo that was a successful homage to the Chinese theme, especially when completed by his Louis Leeman slipper shoes that featured gold embellishment. Common: The crane pin on the lapel of his traditional chocolate Prada tux was a subtle yet effective nod to the theme. Ansel Elgort: I wasn’t as excited about the sheen or silhouette of of Ansel’s one-button jacket that appeared mismatched to the pants. Miguel: Taking a page from the style books of many of the ladies, the recording artist relied on a vibrant red hue to deliver Chinese inspiration in his Michael Kors custom suit. It certainly stood out on the carpet, but I’m not sure it did so for exactly the right reasons. Justin Bieber: Also colouring outside the standard suiting lines, the Biebs attempted to reflect the richness of the Chinese culture in his eye-catching Balmain gold dragon-embroidered jacket and black shirting. He lost me with the slouchy pants and hipster shades, though. Michael B Jordan: Another man who bravely embraced the theme, his lace-embroidered, deep bottle green three-piece Dolce & Gabbana tux was distinctive yet refined. It helped that it fit him like a glove. Eddie Redmayne: Attending the gala with his Valentino Couture-clad wife Hannah Bagshawe, Eddie was also dressed in a Valentino black tux to complete this power couple’s entrance. Yes, we’ve seen him in far more interesting looks, but this one had an undeniable classic sophistication. Joshua Jackson: With Diane Kruger at his side, the actor exchanged black for dark midnight blue in an Alexander McQueen suit featuring contrasting lapels. Richard Madden: The ‘Game of Thrones’ actor added a differentiating touch to his tux with a white satin bow tie. Dwyane Wade: The basketballer took his thematic look to new heights in a Versace blue tuxedo, custom red sash, and white bow tie with Buccellati jewels adorning the tie and jacket. I have to say it was far more interesting that his girl Gabrielle Union’s look. Joe Manganiello: Looking like every bit of the handsome stud that he is, the actor suited up in a sturdy and sleek Ermenegildo Zegna dark tuxedo and bow tie with a white dress shirt. Lenny Kravitz: While I wasn’t impressed by Lenny’s tonal blue pinstripe Valentino tux (or his completely off-theme shades), I have even less affection for Lisa Bonet’s overwrought Valentino Couture embroidered gown which just appeared mumsy and rather drab among the more vivid colours of the evening. Adrien Brody: The actor deserves much credit for being one of the few alongside Usher and Justin Bieber for staying on script. His Chinese embroidered Dolce&Gabbana Alta Sartoria jacket was worthy of much praise. George Clooney: Nothing but classic Giorgio Armani will do for the actor, and you will get no complaints for me, especially when his red pin pocket square his wife flame red gown.